Within the many respected Nikon product lines, the PROSTAFF name is synonymous with dependable, rugged optical tools engineered to enhance every outdoor experience. 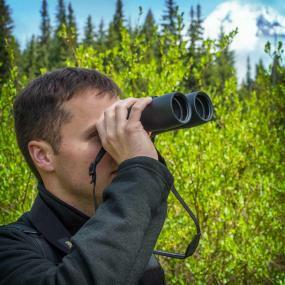 The PROSTAFF 5 binocular line lives up to its name with fully multicoated optical system, multi-click, turn-and-slide rubber eyecups, long eye relief, waterproof/fogproof performance and a lightweight and rugged, yet sleek and comfortable body. 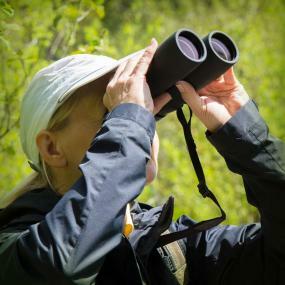 One of the best features of the PROSTAFF 5 binocular is that all of the lenses are fully multicoated coated. This is what ensures that the colors you see are rich and true to life, such as deeper blues and vibrant reds. 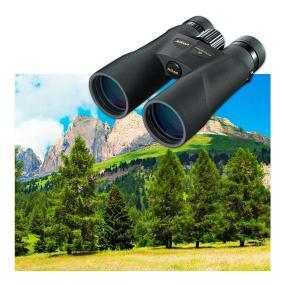 Another advantage of have a binocular with Nikon’s multilayer coatings is that the higher light transmittance results in a clearer picture, giving you a more detailed image of that eagle nesting on a treetop or of the deer on that next ridge. Nikon also uses lead and arsenic free Eco-glass, guaranteeing that they are safe for the environment. The PROSTAFF 5’s long eye-relief ensures a sufficient space between the user’s eye and the binocular’s eyepiece lenses to make them comfortable for everyone, even for those wearing eyeglasses. The multi-click turn-and-slide rubber eyecups make it easy to find the correct eye positioning to see the full field of view. Thanks to a fiberglass-reinforced polycarbonate resin, the PROSTAFF 5 is light enough to take anywhere and strong enough to be trusted on even the more extreme adventures. Because it’s Nitrogen filled and O-ring sealed, the PROSTAFF 5 is waterproof and fogproof, giving you peace of mind that your optic will hold up in any weather conditions. 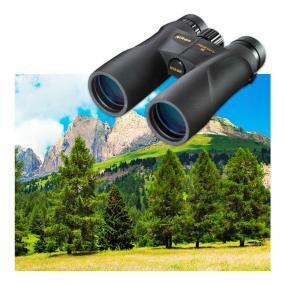 Oceanpro 7 x 50mm binoculars with compass.